CNG: Printed Auction Nomos 2. PHOKIS, Delphi. Amphictionic issues. Circa 336-334 BC. Stater (Silver, 12.10 g 10). Sale: Nomos 2, Lot: 69. Estimate CHF40000. Closing Date: Monday, 17 May 2010. PHOKIS, Delphi. Amphictionic issues. Circa 336-334 BC. Stater (Silver, 12.10 g 10). Veiled head of Demeter to left, wearing wreath of grain leaves. Rev. 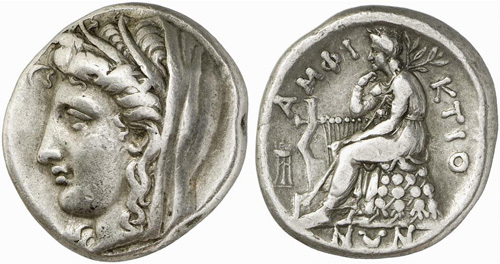 ΑΜΦΙ-ΚΤΙΟ-ΝΩΝ Apollo seated left on omphalos, resting his chin on his right hand with his right elbow propped on a large lyre at his side, and, in his left hand, holding a laurel branch; to left, small tripod. Gulbenkian 487 (same dies). Kinns, Amphictionic, dies O3/R6. Svoronos, Delphi, 32. Very rare. Lightly toned and a very pleasing coin, very fine. An earthquake in 373/2 severely damaged the Temple of Apollo at Delphi: reconstruction went forward slowly and was even stopped during the Phokian occupation of 355-346. However, in 338/6 the Amphiktions decided to use the temple treasures to create a new coinage to finance the work - and to publish all their accounts in inscriptions, which still survive. They issued staters, drachms and hemidrachms, which are among the most elegant of all the later 4th century coinages of Greece. On the obverse of this stater we see the head of the Demeter from the temple at Anthela (near Thermopylai - also in the charge of the Amphiktionic League, while the reverse shows us a pensive and rather patient looking Apollo: probably waiting for the repair of his sanctuary to be finished.